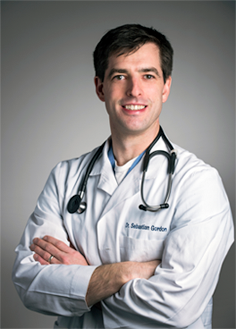 Dr. Gordon graduated from the University of Vermont with a BS in Animal Science in 2001. After four years at the Cummings School of Veterinary Medicine at Tufts, he participated in a one-year small animal internship at the Animal Medical Center in New York. 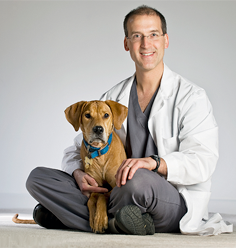 Following a three-year small animal surgery residency at the Ontario Veterinary College at the University of Guelph in Canada, he achieved Diplomate Status as a board-certified surgeon in 2010. After four years in a small animal surgery practice outside Washington, DC, he and his family moved to Tasmania where he joined a small animal hospital and was the only specialist (surgical or otherwise) on the entire island. Missing the oppressive mugginess of DC summers, the Gordons returned to their Bethesda home in 2016 and he joined Lazar Veterinary Surgery. When not in surgery, Dr. Gordon tries to survive raising three sons. In rare moments of peace, he enjoys finding the perfect recipe, talking about outdoor activities, and subjecting innocent bystanders to his banjo playing. Hannah is a British native that emigrated to the US after college in 2003. She entered the veterinary field quite by accident when she took a Saturday job at a small clinic whilst studying for her Masters in Clinical Psychology. After quickly realizing she was pursuing the wrong dream, she shifted gears and started working at a Northern Virginia general practice in 2007. Developing an interest in surgery, she moved into specialty medicine and began studying for her degree in veterinary technology in the evenings. Hannah was staff supervisor for a large surgery group for three years before taking time off to start a family in 2012. 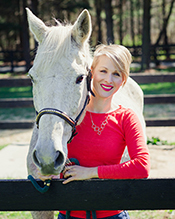 She joined Lazar Veterinary Surgery the following year, working from home on her farm in Western Loudoun County that she shares with her horses, dogs, cat, chickens, fish, two beautiful daughters, and long suffering husband. Hannah spends most of her spare time training and competing her retired racehorse, Rigby, in local horse trials, and passing on the horse obsession to her girls. Christina Charity graduated from the University of Maryland, College Park with a Bachelor of Science in Animal Science with an emphasis in equine studies in 2007. After experience working at a thoroughbred breeding farm and fearing flying hooves on a daily basis, she has happily settled into small animal medicine over the past 9 years. In October 2016 she branched out from general practice to join the surgical world at Lazar Veterinary Surgery. With an at home “farm” of 14 chickens, 5 ducks, 2 horses, 3 dogs, 2 cats, and an array of fresh water fish, she understands first hand how powerful the bond between humans and animals can be. When not working, she spends the majority of her time maintaining the farm and catering to her spoiled critters. Mary Barnette grew up in a rural town in Georgia, where she first began her career in veterinary medicine. After a break from working due to living overseas, she moved to northern Virginia where she began working again as a veterinary assistant. She has had a love for animals for as long as she can remember. She received her Veterinary Assistant certificate from the Animal Behavior College in 2012. She started working part time with Lazar Veterinary Surgery in 2013 and eventually joined the team full time in 2015. Her “mini” zoo at home consists of 3 Bully dogs, a cat named Mumbles, and a saltwater fish tank. When she isn’t working, or catering to her animals’ needs and wants, she happily spends her time with her husband and 5 year old daughter doing mostly kid things, while imagining all of the adult things they’d like to do but will pick back up one of these days. Kate is a Northern Virginia native who has always had a passion for animals. Over the last 6 ½ years she has learned that veterinary medicine is where she wanted to spend her career and started going to school online to earn her degree in Veterinary Technology while working in a small animal practice. Within the general practice, she learned that surgery was her real area of interest and was thrilled to join the Lazar Veterinary Surgery team in August 2017. After graduating and becoming an LVT, Kate plans to continue taking classes and become certified in surgery and anesthesia. Currently Kate has no pets that live with her but enjoys spending time with all the family dogs and cats, and is looking forward to the day when she can adopt another Dachshand and hopefully one day have a little farm of her own. MacKenzie has been an animal lover her whole life, and knew she was destined to work in veterinary medicine. She has worked in general practice for four years, and also in an emergency setting, before joining Lazar Veterinary Surgery. She is currently in school working towards obtaining her license as an veterinary technician, and also works part time at one of our referring clinics. She has six dogs in her family ranging from six months of age to sixteen years old.